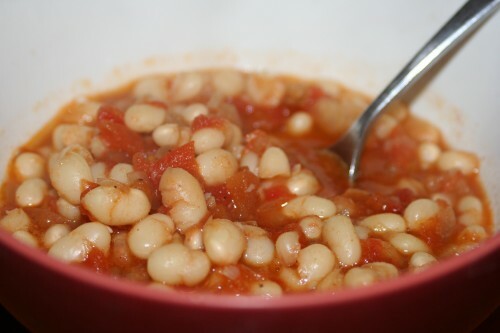 The other night I made these baked beans for supper accompanied by a mixed green salad and biscuits. It was delicious, nourishing, and filling. I usually think of baked beans as a side dish, but we love this recipe so much that it's our main course (since I first made this a couple months ago, it's been in regular rotation). And Jeremy happily anticipates the leftovers in his lunch the next day. I typically soak and cook my own beans, but canned work just as well, feel free to add more beans if you want them a little less saucy--I often do that. I love that this is so full of flavor and spice with just a hint of sweetness. Try this recipe, for a main dish or a side, you'll be glad to have it in your repertoire. Heat the oil in a saucepan over medium-high heat. Add the onion and bell pepper and cook for 3 minutes. Add the garlic and cook for 30 seconds. Add all the ingredients up to the beans and whisk to combine. Add the beans and water and bring to a boil. Reduce heat and simmer until the liquid thickens, about 30 minutes.